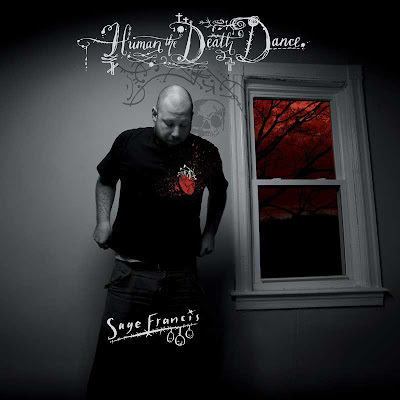 My friend and long-time inspiration, Sage Francis, releases his latest album in May called Li[f]e, named after a line from one of his earlier tunes on what is one of my most-played albums, Personal Journals. Anyone who's kept an eye on what I've been doing for the last ten years will have an understanding of how important Sage's work has been in developing my own, and Sage's words will need no introduction. 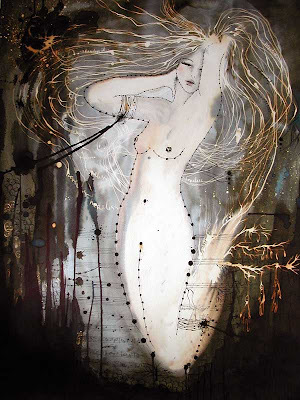 But for anyone who isn't aware, it was Sage's music which prompted me to undertake one of the biggest and scariest projects I've ever done, my show 'If A Girl Writes Off The World', in 2006. Sage's songs are strewn with tiny linguistic gems and white-hot pin-pricks of personal expression, leaving the hip-poppers littering their charts with fake diamonds and teeth. And if being reduced to tears or smarting from a sharp political smack round the chops isn't enough to remind you you're alive, his beats'll do it for you. I wish I had written the words, but I didn't; I can only pick up the crayons and scribble hard at what they conjure...it's going to take more pictures and more day trips out of the comfort zone before I can say I've done this man's work justice. The exhibition was a collection of 2- and 3D pieces made as a raw and energetic response to a selection of his words. In contrast to client and professional work, these pieces were imperfect and impulsive, some being sold, some becoming permanent installations with fans around the world, and some making their way to the walls of Sage's home, where I'm proud to say they remain to this day. A video of the show coming together. Voxpops of the show with Sage making a cheeky entrance/exit. When he asked me to produce artwork for his previous album, 'Human The Death Dance' (above), I was awestruck and bloody excited - what's better than being asked to do cover art for your favourite artist? 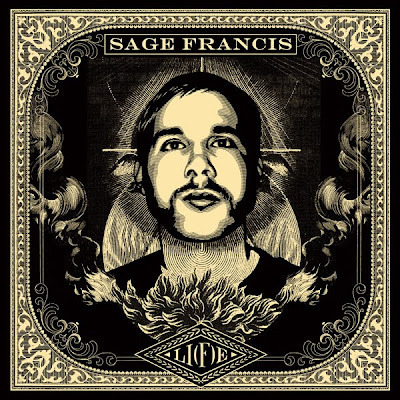 But I was equally excited for to discover Sage's next cover artist is fellow Rhode Islander Shepard Fairey, who's created this beautiful illustration based on an old snapshot of a very caucasian Sage from a time when it wasn't at all cool to be a white rapper. Not one to give in to tired and silly rap preconceptions, Sage stuck his face in all its pasty beardy glory on his album cover, and it became one of his most iconic images. Having watched Sage's cover art move from hand-drawn covers, photocopied for free at Kinko's, to collaborating with one of our most renowned artists (and fellow Bernstein & Andriulli creative) has been a journey I almost feel a maternal pride in; this is a man who's worked harder than I can describe to get his label to where it is today. Constantly in awe of his vision and commitment, I'm proud to have played just the tiniest part in that! Congratulations Sage on the beautiful artwork and I cannot WAIT to hear the album. 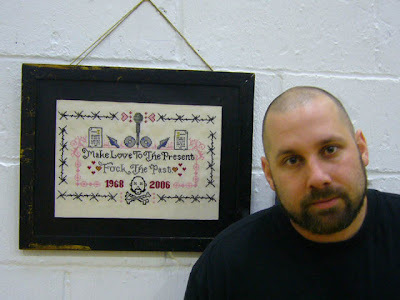 Sage Francis starts touring in May 2010. Read about and order the new album here.